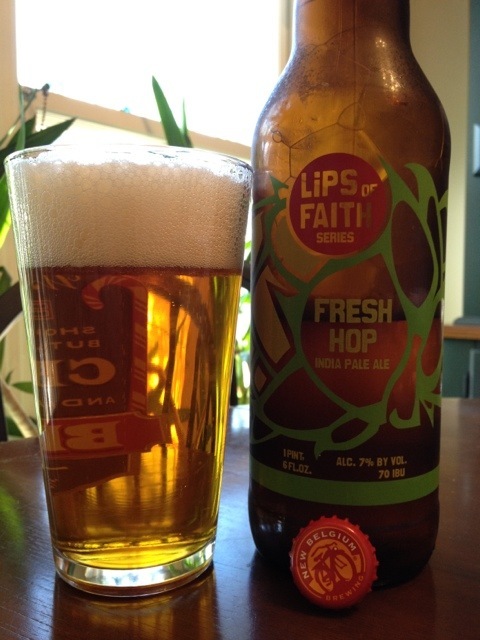 New Belgium Fresh Hop india Pale Ale from the Lips of Faith Series jumps out of the bottle as it is uncapped with hops aroma being pushed out as the pressure rushes to equalize. The appearance is very golden with orange to copper colors. The head is big at the start and fades slowly with thick lacing. The aroma is very strong and full of citrus and grassy characteristics. A little bit of a pine aroma is present, too. The taste is mellow compared to the aroma. There is a very even hop flavor throughout the mouth, but a pine flavor returns to provide a stronger hops finish to the beer. Overall, this is a very good fresh hop beer. Some would appreciate a taste profile that is richer in flavors. The 7% ABV helps make the beer very drinkable. 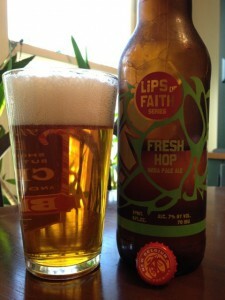 This entry was posted in Brews and tagged New Belgium by Brian Allen. Bookmark the permalink.